It was a busy weekend for races and we were spoiled for choice (Raby, Pier to pier, Windermere and Calderdale). Having done Raby for the last couple of years – I decided this was the one to do again. The day dawned bright and breezy, so could I improve on last year’s time? This year the parking was adjacent to the start and finish – so no long dash to the start – which seemed to work very well. There were a series of events, with a fun 1.2k and 5k and then to finish the 10k – which is two 5k laps of the estate – either tarmac or good forest track. There is a long uphill at the start of each lap and a nasty sharp rise around 4 and 9K towards the end of each lap – so not one for a 10K PB. As is usual there were a number of striders warming up and chatting before the start, which makes it all very sociable. I’m not sure if Gareth and Rob were psyching each other out as to how easy they were going to take it, but they soon disappeared in front once we had started – and from the results do not look to have been taking it too easy. The wind was against going up the first hill, which did make the going hard – but we were sheltered to a degree by the trees to the side. On reaching the top and turning down to the farm – which should have been a relaxing way to get back into your stride – the wind made even that bit of down hill hard work. The views – if you choose to look – are stupendous by the way. The second half of the lap apart from when you come out of the woods is very pleasant running. There was a tail wind on the open section and not too warm. I felt I was going OK and the two laps were approximately the same time so managed the pacing OK. On the final run into the finish there is always a good crowd to cheer you in. Initially I though I was a tad slower than last year but I had remembered the wrong time and as it happens managed a few seconds quicker – so that was very pleasing. No monster goody bag and T but very welcome cake, banana and water. What is there not to like. Despite the wind and the hills there were excellent performances – well done to all. Hopefully there will not be the clash of events next year and more can sample the delights of Raby – a very scenic and well organised event. 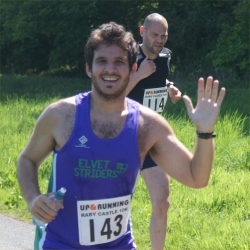 As a relative newcomer to running, I haven’t done many races, but Raby 10K seemed a good one to try. It ticked all my boxes: scenic course, close to Durham, family-friendly and the right distance for me as I’m doing Allan’s pilot 10k training at the moment. Fine weather was promised, and this would give me my first opportunity to wear my Striders vest as a vest rather than an extra layer. Exciting! The weather did not disappoint: it felt like the hottest day of the year so far as we trudged up to the start from the carpark. Not having run this before, I didn’t have a particular goal in mind and my ‘race plan’ was simply to get round the 2 laps in as fast a time as I could manage in the heat. However I received some good advice at the start (where Purple Power was much in evidence): don’t go off too fast – save yourself for the first hill about 1k in. I followed this advice and got to the top of the hill where the views were brilliant. Bumped into Alister on the way down and got some more good advice from him: don’t run this at your parkrun pace! I realised I was probably going too fast and tried to pace myself better. The long downhill stretches were exhilarating, and after another short but steep hill we were onto the second lap. By this stage the heat was clearly getting to people, so the water was very welcome. There were also some nice breezes and shady sections which made the uphill bits more bearable. The last kilometre seemed to go on forever, and although I tried to accelerate at the end, I had no energy left. Crossed the line exhausted, and was rewarded with a banana and cake. Then it was time for the main event (as far as my family was concerned): the picnic! Other Striders clearly had the same idea and a Purple Picnic ensued. Food consumed, we did a quick tour of the lovely Raby gardens before heading home. This race fulfilled all my expectations. The organisation of the 10k itself was excellent, and there was also a 5k race and a 1.2k fun run for under-12s – perfect for Strider children. Beautiful setting apart from that bloody hill twice. Did not pre-enter as I was not sure of the weather forecast, if bad, it would have meant that Judy would not be able to move around on the mobility scooter and look after the dog. Anyway on arrival went into the grounds via the signposted route only to be turned round and enter by the normal route to gain access to disabled parking area. Discovered that registration was 1.5k away from the start so off I went with money and form in my grubby little hand to claim my number. Guess that had to do for my first ever warm up. Back at the car sorted Judy and the dog out and watched several purple patches of Striders doing very fast gyrations to the music before the start. Some great movers, pity no camera available. Did see some little young and older Striders and Durham parkrunners finish the 5k and get their medals. Set off with Capt. Sue who was going to take it easy after returning from being out of fettle and marathons, we parted company on the first hill and I then caught Karen Younger up and ran together. At half way we were spurred on by Anne Nicholson, Jackie Smith and the Chalkeys and the main member of the said family. You have guessed it. The Dog. Thanks folks. After the second long climb then onto the nice long downhill we checked our Garmins to discover big discrepancies – mine saying 12 min mile pace and Karen’s 9.30 pace: unbelievable when the blurb says how accurate they are. Somehow the electronic ether managed to get it sorted. At the farm 7k we picked a target runner 500m in front to catch 100m before the finish and beat this was done with comparative ease. Why? Cos at the 9k mark the smell of the chocolate covered fairy cake memento at the finish was drifting across the course on a nice cool breeze. Definitely was too much to resist and then it was a sprint to the finish passing several folks alang the road. Oh!!!! that is a different race never mind, they had the pleasure of eating our dust before their cake and we did manage our target, coming in at 63 and 64 respectively with Capt Sue just behind. 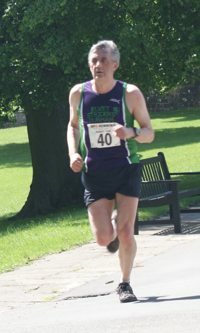 Good to see some of our training partners taking part namely Hunwick Harriers, Crook AC and Durham parkrunners. It was noticed that G N was too busy talking to eat his cake so it was taken off him for seconds. I was not planning on doing Raby Castle as I had not really registered it was on. At the park run I heard mention of Druridge Bay and Raby Castle. As it happened there was nothing else on the home calendar – the lawn cutting could wait – but did not realize until I got home after running fairly hard at the park run (and also running there and back). I thought I had not raced a 10k for a while and was amazed when the Garmin record said my last 10k was in 2008 and I had to search the internet results and found that I last ran Raby in 2006 (which was before the present web site results)! So I was certain for a personal best for the decade 2010s! Sunday morning and I was prepared with my entry form and cash – it says the start is 15 minutes from the parking but the entries were only 5 minutes. I arrived early and having registered I went back to my car for a bit of a rest then met up with various Striders on the way to the start. The Sea of Purple was amassing and the kit certainly stands out. There are many who I do not really know in the Striders but the purple kit gets you talking to fellow team members which is absolutely fantastic. It was also good to meet up with Tony Young and Jackie Smith. 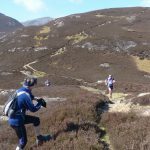 The day was bright and not too warm, the course I knew to be “undulating” – nothing to the fell runners in the club but enough challenge for me. 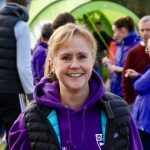 My race plan such as it was – do not go off too fast and make sure the first 5k is slower than the average park run time. Off we went. The course is on tarmac or very good forest trails. By the first km I could see Adam miles ahead (well certainly a few hundred metres – or yards for those of us who know about the old money) in or around the top ten and not far behind was Simon. Graeme had admitted to a bit of socializing at a stag do on Saturday night and was around and about me. I decided to try and stay with or around Graeme. He would pass me going up and I took him going down on the first lap (of two). I went through 5k in just over average park run time – so all was going to plan. He came past at around the 6k mark on the second long climb and I could not catch him again – but he was just that bit ahead and that encouraged me not to slow down. The views from the top as you come over the hill are stunning and I think make the climbs worth while. The downhills are not too severe and allow the legs to open up a bit. As always at the finish there are cheers of encouragement and groups of Striders – there was even a bit of a photo on a phone. As I predicted a PB for the 2010s but as it was the one and only so far not too surprising. The second 5k was around a minute slower than the first – so I think the plan worked. Two races (or at least a hard “run” and a race) in two days is not something I have done for years and the legs certainly felt it. You never know I might try another 10k in the not too distant future. One to be recommended for the beautiful scenery, it’s not far from home, probably lots of other good reasons and all in all a “cracking race” but not one for a PB. I have run the 5k fun fun two times in previous years, and my memory is filled with blazing heat, an undulating course and injury ridden runs, so running two laps rather than just the one this year didn’t really fill me with anticipation, especially arriving to 25 degree heat. 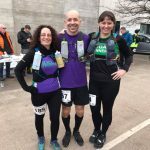 Was picked up by the lovely Phil and Anna, picking up Mary and Fiona on the way to eventually meet up with around 30 other Striders to form a sea of purple over Raby. After burning in the sun for a while we all headed over to the start line, further back from the front than I would usually start with a specific race plan in mind – I didn’t want to go off hard, a negative split, not exerting myself for the first 9k then finish fast with a last 1k sprint. Just before the word go, a very elite looking runner sprinted to the startline and asked if he could tie his lace, just as well we waited for him as this was Yared Hagos, a man who has set out to break all of the course records in the region, who shot off and ended up breaking the record by over a minute, 4 minutes ahead of the second place, wow. Originally set off with Neil Sleeman, but it only took me 200m to realise that he was way too fast for my plan, or for me in general. I’d heard about the first hill being the worst and can kind of remember it being bad, thankfully, with it being the first time around I was fresh enough to smile for the evilly placed photography of Phil at the peak. Shooting down the downhill straight after the hill of death, trying to catch someone who looked my age up ahead, sandwiched in between beautiful views from all directions I started to appreciate all the things I couldn’t appreciate last time because of injury, cursing and limping, I really liked this. Although there was a small hill that you meet at the bottom of the downhill, once the first 2k of each loop is over you can coast down a straight lane which was either slightly downhill or had a tailwind, either way it felt a lot easier than it should be. The sheltering of trees was then next to be appreciated, relieving you of the heat with an instant cooling feeling, and it kind of lulls you into a false sense of ‘oh this isn’t so bad’ before sneakily leading you onto the last little hill of the loop. However, I don’t think the course was that bad ascent-wise, once you’ve conquered that hill its only 1k of a downhill finish left, or 6k of the loop that you just enjoyed. The second lap was pretty much just as good, passing an old running friend on a water station, despite not being able to actually drink the water, and being evilly snapped by Phil once again, this time covered in water after a failed attempt at hydration. Second time on the big hill was problem-free, the junior-looking person had caught up to me but would soon drop off the pace after the downhill, the pack I was in had now broken up leaving me to pace myself, which is something I’m not good at, decided to kick on a bit and catch a few in front of me, took me a while to catch anyone, but found and caught a few coming up the last hill. I LOVED the last km, had enough energy to plough on, coming past much appreciated support from Dave and Sam and friends from parkrun, which other spectators then caught on, shouting my name, despite the fact they had no idea who I was – I know you’ll never see this but thank you – held off some fast finishers behind me to finish in 40.55, which I was more than pleased with, 19th place and 1st junior, no age category prize, but it was a moral victory 🙂 I was handed a lovely race mug by a very smiley marshal team and went off in search of a spectator spot. Found one just in time to see Simon Gardner and Fiona Shenton finishing together, very well done to Fiona for not only winning her age category but on coming 2nd lady! Jan Young also won her age category, good prize haul for the striders team 🙂 Also a PB for Pippa, which on a hilly course in overheated conditions is superb! Although I thought the run was lovely, I have been known to enjoy the food aspect of races, caterpiller cake, pringles and pork pies galore, perfect way to finish a hard day’s running! I hadn’t really planned on doing this race but Elfie and her friend Nic decided to do the 5km run and I came along as support. 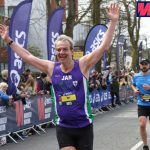 With a marathon planned for later in the year I thought it would give me an opportunity to get a feel pace and tailor my training a little over the summer. But there was a rider, in over 12 years of running this was to be my debut road race! Okay, perhaps a little more qualification is needed. This was the first road race I have done over a standard distance. As far as running goes, I’ve spent years orienteering and fell running. Neither of those disciplines exposes you to the sort of pacing needed for a 10km, despite it being a typical distance I compete over in the forest or on the fell. In fell racing my pace is dictated by the steepness of the hill (and whether it is up or down!) and the roughness of the terrain. In orienteering trying to navigate and run across brashing-strewn forest floors presents a unique challenge to maintaining pace. Even with all this in mind I approached the race with my trepidation suppressed by a relatively new Garmin and a cunning plan. I mean, how difficult can it be just to look at my watch and adjust my pace? In addition I had a strategy that went beyond the Garmin. I was going to use Alister as my pacer and see how it went. If I felt good after 5km I’d just turn it up a bit for the second half. I’ll come back to how this all worked out. We got to Raby Castle quite early as the 5km starts 45 minutes before the 10km. The weather wasn’t looking promising for our planned post-run picnic, it was overcast and breezy to say the least. We walked to the start to find Elfie’s friend Nic and get a feel for where the start and finish were. I bumped into various Striders and then went to see Elfie start her run. The 5km run had lots of children, rugby players in pink wigs and tutus and several members of Village People. And some of those little kids didn’t half hare off, certainly faster than the rugby players. I then killed a bit of time worrying about how cold it was and whether I should take a layer off. I finally resolved to strip down to my vest and after a brief warm up it felt like the right decision. The sunshine was starting to break through and other than the wind it was quite warm. With five minutes to go the starters called people up and I found my place in the pack a little behind Alister – he’s not difficult to miss in that hat! A few minutes later there was a whistle and we were off. I did remember to start my watch, something I often forget in the heat of a mass start. As the pack started to open out I stuck to my plan and kept that dayglo hat in my sights. Then, after not that far, I thought Alister just wasn’t trying hard enough. So I edged ahead and upped my pace a little. I felt comfortable and then the first hill hit me! It’s not like it’s the sort of hill I meet in fell races but it was disturbingly sapping. Not only that but as you rounded the summit you were hit by an almighty wind on what should have been the easy drop down to the farm. Then, at some point, I don’t remember exactly where, I saw a dayglo hat go past. I tried my hardest to hang in there and by 5km I wasn’t that far off Alister. But any thoughts I had to turn it up a bit had evaporated in the heat of the noonday sun. The second circuit was like the first only harder and without the upbeat start. Alister’s hat disappeared, along with Alister, into the unreachable distance. And as I battled downhill through against wind a second time a cheery John Hutchinson said hello as he breezed past. I dug in and struggled on with the odd person passing my as I failed to keep any sort of pace at all. On the final stretch across the dam I even failed to catch the bloke who was walking and limping badly. The very sight of me seemed to heal his limp and propel him into running for the finish. It felt great to cross the line and despite tipping 48 minutes I can still call it a PB. So, how about my two point plan? On the first point, it turns out it’s not easy at all! Certainly not at Raby Castle where there are four climbs on the 10 km course. Certainly not on a day when running downhill is against a fierce wind. On the second point, if you are going to use someone as a pacer then don’t go off faster than them on the assumption they are going a bit slow! I.e. don’t underestimate the ability of an experienced road runner such as Alister to get it right. And, pick the right pacer, someone who isn’t faster than you. Of course there are some plus points. It is a beautiful run with some fantastic views. Oh, and there’s a t-shirt. I’m not sure I’d want to do a road race every week but I might at least try to get a few more PBs… anyone know a nice 10 miler? Half marathon? 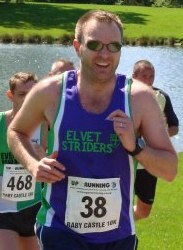 I’m developing a love-hate relationship with the Raby Castle 10k. I hate the never-ending, gut-busting hills which go on forever, and then you run downhill only to have to go back up them all over again. Something about the third hill just before the 5k and 10k points just turns my legs to jelly and my breathing to something that sounds like Darth Vader. However, I have decided that the stunning location, the enthusiastic supporters, the beautiful wildlife (deer, sheep, cows – the cows actually lined up to moo at the runners! ), and the ever present Sea of Purple (15 Striders), do make up for all the hills. After a few rain showers before the start, the weather cleared up to make way for a beautiful hour of running during the race. I knocked about 4 mins off my time from last year so was pretty pleased with that, it’s certainly not a PB course for most people, although I think Steph Barlow managed to crack 50mins for the first time! A truly lovely run if the hills don’t kill you, with a very nice red t-shirt at the end. Highly recommended! What a fantastic event. It was a beautiful day for a run and I can think of nowhere better than the grounds of Raby Castle. There was a great turnout from the Striders and everyone seemed to have a good run on what was an undulating course on the hottest day of the year so far (or so it seemed). There was loads of support and it was great to be cheered home on the final straight. Highly recommended unless you want to run a PB! to see a ‘Sea of Purple’, supported by parents, partners and grandbairns. 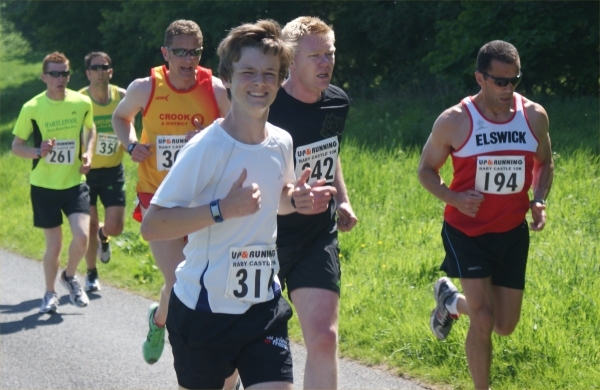 A lovely sunny day for this race which went on the usual route through the park surrounding Raby Castle. It was breezy, but it was from the east so we were blown up the first hill, but it made the hill up to the lakes a bit harder. Fewer Striders than usual at this race and Mike was the first Strider home. Friendly marshalls and well organised as usual. A long queue for the tearoom was the only disappointment !